(Ottawa, Ont.) 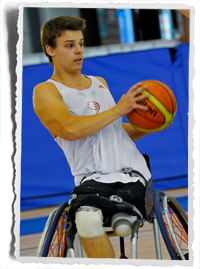 Wheelchair Basketball Canada is pleased to announce Nik Goncin of Regina, Sask. 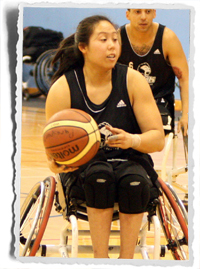 and Amanda Yan of Burnaby, B.C., have been selected to represent the sport of wheelchair basketball on CIBC Team Next. Goncin and Yan are two of the 67 amateur athletes from across Canada who will receive from CIBC $15,000 in funding over three years as well as invaluable life skills and sport mentorship from eight of our nation’s finest high performance athletes. The CIBC Team Next mentors include: Josh Cassidy, Mark de Jonge, Stephanie Dixon, Kara Lang, Kyle Shewfelt, Mary Spencer, Bruny Surin and Simon Whitfield. The athletes were unveiled in a special ceremony on Monday, November 18 amid much fanfare at Ryerson University’s Mattamy Athletic Centre in Toronto. CIBC Chief Operating Officer Richard Nesbitt, the Honourable Bal Gosal, Canada’s Minister of State (Sport) and the Honourable Michael Chan, Minister of Tourism, Culture and Sport for the Government of Ontario were on hand for the event, along with pre-event entertainment from PACHI, the official mascot of the TORONTO 2015 Pan Am/Parapan Am Games, and freestyle soccer demonstrations. CIBC is the Lead Partner of the 2015 Games and recently joined the Canadian Paralympic Committee as a Premier Partner. CIBC designed the CIBC Team Next program in partnership with AthletesCAN, the association of Canada’s national team athletes, and the Canadian Sport Institute Ontario to create a lasting sports legacy in Canada. To be considered for the program, the athletes had to be nominated by their national sport organizations. Preferred CIBC products and services. Each of the 51 sports and disciplines in the TORONTO 2015 Pan Am/Parapan Am Games are being represented.